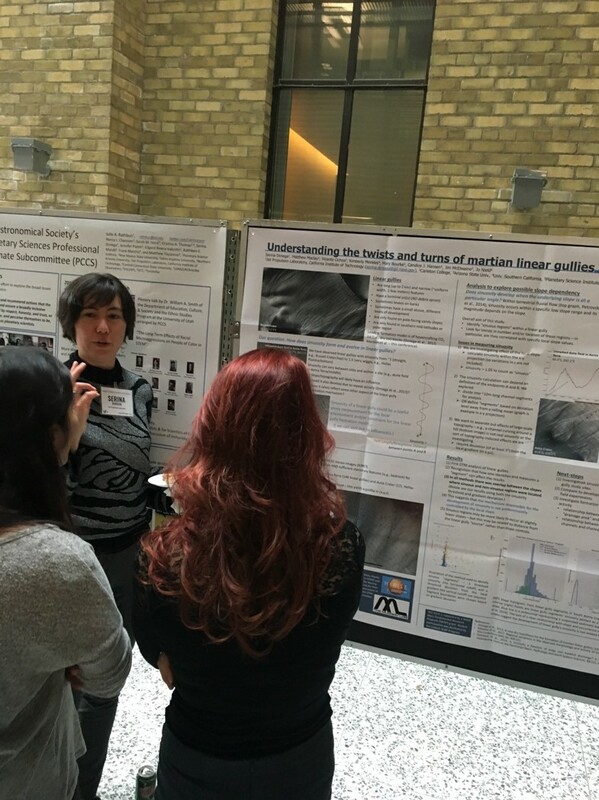 I'm currently a senior physics student at Coe College, and recently I had the opportunity to travel internationally to a conference in Toronto. I am Coe's current SPS Chapter President, and in the past few years I have planned many of our outreach events and conference travels, including the trek to the 2016 PhysCon. I've found that conferences are pressure cookers for collaboration and professional growth, and I encourage all undergraduates to attend at least one conference. In 2016, I was an SPS Intern at NASA Goddard, working with Ed Wollack on infrared absorber coatings. It was this research experience that solidified my interest in the space world and since then, I have worked at Planetary Resources, Inc. and applied for graduate studies in aerospace engineering and planetary sciences. At Coe, I have also led a movement of creating a community for women in STEM fields which has become a personal priority of mine alongside a career in space. 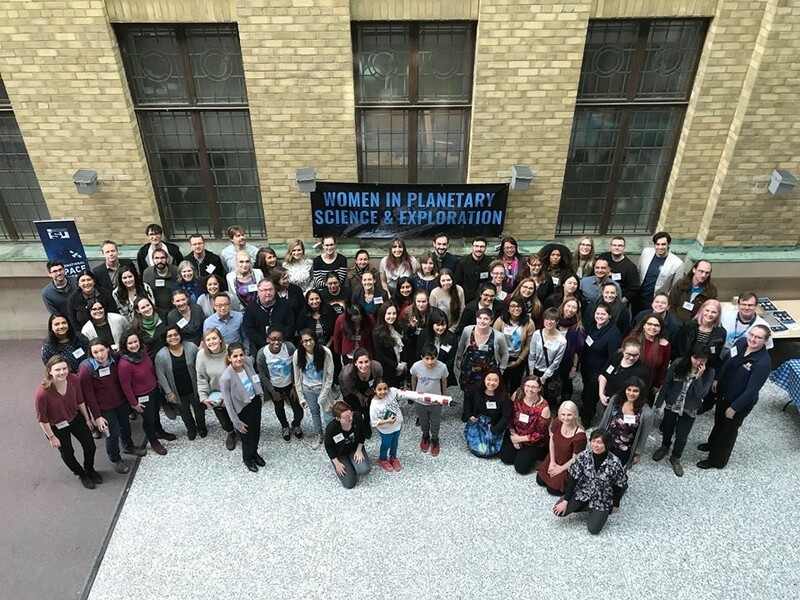 There are astronomy and space conferences, and there are conferences for women in STEM fields, but never have the two subjects been combined so effortlessly and considerately as it was at the first Women in Planetary Science and Exploration (WPSE) conference at the University of Toronto. People of all genders showed up to hear talks and give talks, which was encouraging and indicates the inclusivity of the conference. The attendance was roughly 100 people, of which half were American and half were Canadian scientists and engineers. Many universities and colleges were represented from all over the two countries. The talks given could fall under the topics of women in stem issues, education and outreach, meteorites, terrestrial planets, and the outer solar system and beyond. The presentations displayed fabulous research without focusing too heavily on the personal, while the intermittent panels reminded the audience why they attended a women's conference in the first place. The talks were given by professionals, professors, graduate students, and many undergraduates whom had never spoken to such a large crowd about their work. There was even a surprise visit by Arushi Nath, 8, and her brother Artash, 11, who spoke about her model Canad-arm, a robotic arm used on the Space Shuttle orbiter to deploy and capture payloads. 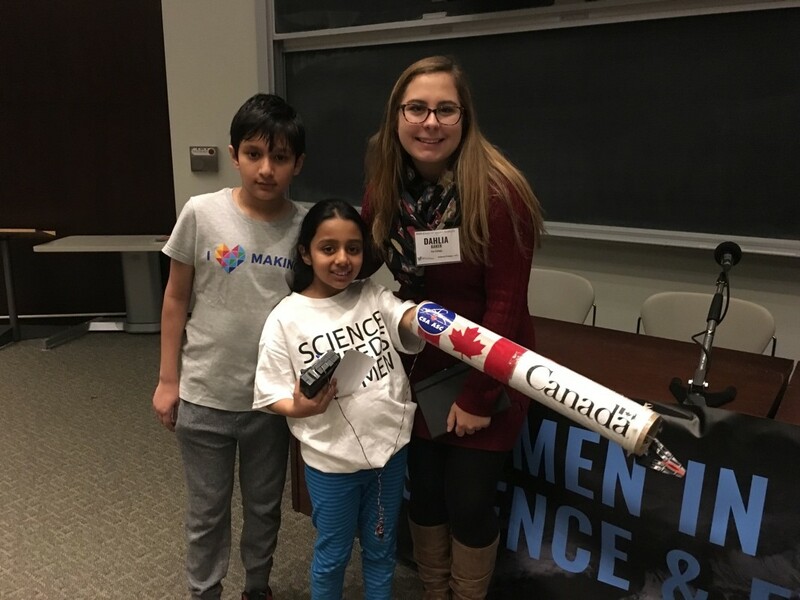 Arushi recently won the Space Apps Challenge put on by the Canadian Space Agency with her recreation of the Canada 150 logo using RADARSAT-2 images of the country. The conference presentations were opened by Dr. Tanya Harrison, Director of Research at Arizona State University and an organizer of WPSE. Her first slide set the tone for the rest of the two-day event, starting with the quote "Per Aspera As Astera", or through hardship to the stars. She also took a moment to recognize the indigenous culture of Toronto and the lands and people who lived here before European colonization. The talk she gave focused on explaining what is meant when news reporters claim that we "found water on Mars." She explained how scientists keep discovering water in different ways such as rover malfunctions uncovering a lower ice layer, observing meteorite impacts breaking through the rusty surface, or gathering near IR spectra that show hydrated minerals. With her Ph.D. in geology focusing on planetary science and exploration, she has collaborated with many groups research Mars such as the Mars Exploration Rover, and NASA's Mars Reconnaissance Orbiter. Another notable keynote speaker was Dr. Cassandra Steer, an Australian citizen based in Canada who is an expert in international air and space law. She specializes in the regulation of military activities occurring in space. Her talk was remotely given, and through Skype she explained the legal aspects of sending objects to space, putting satellites in orbit, and possibly obtaining resources from extra-terrestrial objects such as asteroids. In space law, every country or private entity is responsible for the materials they put into space or orbit and how they will be eventually disposed of. With the growing problem of crowdedness in low-earth orbit due to the multitude of satellites supporting our daily activities, space law is becoming increasingly relevant in the regulation of these objects. According to Dr. Steer, current laws for safety in space tourism do not exist but will most likely precipitate after some kind of accident, much like the Federal Aviation Administration came about to make air travel safer for passengers. The panels were the personal meat of the conference, and focused on crucial social issues such as outreach, LGBTQ+ issues in STEM, women of color in STEM, harassment in STEM, and non-academic career options. At these panels, the audience was open to ask questions for the 30-minute duration. These questions sparked inspiring, productive discussion about important issues facing the STEM community. During the LGBTQ+ panel, the major takeaway was that your personal identity is expected to not effect your work as a scientist, but it always will, therefore scientists should get more personal to allow for a better culture of acceptance and openness. The women of color (WOC) panel stressed that representation matters to those in the field and those aspiring to become scientists and engineers one day. The recent movie Hidden Figures was recognized for increasing the visibility of WOC in STEM who changed world history with their work. In the harassment panel, the panelists addressed the four different types of harassment one can experience, which breaks down to earnest, hostile, paternalistic, and competitive. Paternalistic harassment gives a name to the situation where a young woman is treated less than capable by the harasser, who assumes they know best for the person. This harassment is difficult to address as the harasser believes they are behaving benevolently. This conference was educational, inclusive, and well-balanced in it's talks and panels. Despite being relatively small, many institutions were recognized across the fields of astrobiology, physics, astronomy, remote sensing, planetary science, and so many others. While the panelists shared their personal stories, the presenters shared the broad science being completed in the field. By incorporating both the personal and professional into just one venue, WPSE has opened the doors to a more inclusive STEM environment in the future going forward. This conference is planned to be hosted yearly, with the next one occurring in spring 2019 at Arizona State University.